As Indias government - fronted by Prime Minister Narendra Modis Twitter account - announced a slew of incentives to propel Indians to discard cash, IndiaSpend found four signs of an expanding base: Five-fold growth in electronic bank transfers and doubling of ATMs and card-swipe machines over five years, and a 50 per cent rise in credit cards over four years. It has been 32 days since Modi announced the scrapping of 86 per cent of India's bank notes, by value, and IndiaSpend's special coverage of the move chronicles the widespread economic disruption-and how Modi has changed his rationale for the move from "black money" and "fake currency" to "cashless economy", which is the now the main narrative. The move to electronic banking - through debit and credit cards, bank transfers, Internet and mobile banking - will indeed accelerate. While the use of cash for retail transactions was 95 per cent, according to a 2013 report from McKinsey, it was 68 per cent in 2016, the Business Standard reported, quoting the CLSA brokerage group. However, as we found, the government's plans do not address significant hurdles, which will likely hinder future growth. 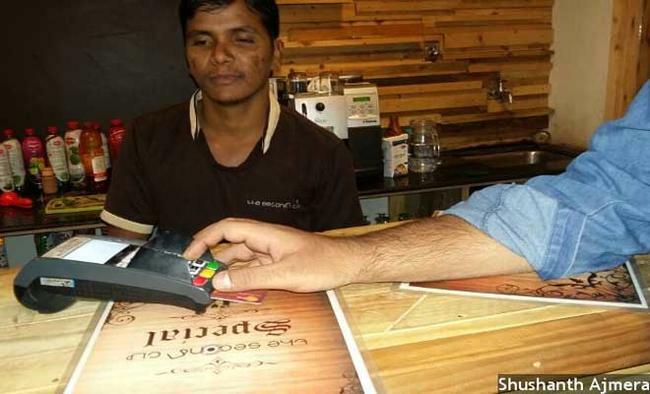 Here are four indicators of expansion in India's cashless economy and the barriers they face. 1. Five-fold growth in electronic bank transfers, 2011-16: Bank transfers made through the National Electronics Funds Transfer (NEFT) system rose five times in number (4.5 times in value), while transfers using the Real Time Gross Settlement (RTGS) system rose 70 per cent in number (50 per cent in value) over five years ending 2016, according to October 2016 Reserve Bank of India (RBI) data. RTGS, which requires a minimum of Rs 2 lakh, allows transfers in "real time", or immediately, while NEFT, which has no minimum, can be done during fixed times. NEFT recorded 1.19 billion transactions in October 2016, compared to 199 million in 2011; RTGS transactions rose from 511 million to 864 million over the same period. Electronic transfers, as the term suggests, requires Internet access. But, only 13 per cent (108 million) of 833 million Indians in rural areas have Internet access. Rural India has been worst hit by "notebandi", as the withdrawal of Rs 500 and Rs 1,000 notes is colloquially called. As many as 73 per cent of Indians cannot access the Internet, IndiaSpend reported on December 3, 2016; India has 342 million Internet users, according to March 2016 Telecom Regulatory Authority of India (TRAI) data. In urban India, 58 per cent of the people have access to the Internet. 2. ATMs and Point-of-sales (POS) terminals double, 2011-16: There were 1.4 million POS terminals and 200,000 ATMs in October 2016, according to RBI data, a doubling of numbers over five years. From an ATM for every 12,000 Indians, there is now one for every 6,500. The number of ATMs rose from two for every 100,000 adults in 2005 to 18 by 2014, according to World Bank data. The State Bank of India (SBI) has opened more than 26,000 ATMs over the last four years, according to RBI data, higher than the next four banks (HDFC, ICICI, Axis and Kotak) put together. SBI, India's largest bank, has also deployed more PoS terminals than any other bank. The government has announced plans to add an additional 1 million PoS terminals. But, the world average for ATMs is 2.5 times India's, Brazil has 39 times as many PoS terminals per capita. The world average of ATMs per 100,000 people was 44 in 2014, according to World Bank data, nearly 2.5 times in India. In 2015, Brazil - with a population 84 per cent lower than India - had nearly 39 times as many PoS terminals (32,995), according to a 2015 report from Ernst &amp; Young. The PoS machine rate was 4,000 per million people in China and Russia. Advanced countries such as Japan, USA and UK had more than 100 ATMs per 100,000 people. 3. Debit cards rise 170 per cent over 5 years; credit cards rise 50 per cent: Credit cards increased from 17.7 million in 2011 to 26.4 million in August 2016, according to RBI data. Debit cards rose from 263 million to 712 million over the same period. But, 53 per cent of adults in 35 high-income countries have credit cards against only 2.1 per cent of Indians. Despite the rise in numbers, 26 million in a nation of 1.2 billion is 2.1 per cent. In the Organisation for Economic Co-operation and Development (OECD) countries - a group of 35 rich nations - 53 per cent of adults had a credit card, according to a 2015 World Bank paper. Credit-card growth in India hit a rough patch after the economic slowdown in 2008, with one in four customers defaulting on dues and 10 million credit cards cancelled, the Economic Times reported in 2013. Debit cards are mainly used for cash withdrawals from ATMs in India; only in urban areas are they used for cashless payments, as March 2016 government data confirm. In financial year 2015-16, Rs 25 lakh crore was withdrawn through ATMs - 5.4 times more than PoS transactions (Rs 3.9 lakh crore). 4. Mobile-phone banking transactions tripled, 25 per cent by value, in 2012-16: Although there were yearly fluctuations, transactions conducted over mobile phones - there are about 600 million active mobile phones - rose from Rs 4,185 billion in 2012 to Rs 5,243 billion in October 2016. While mobile banking transactions rose 2.2 times between 2012 and 2016-from 446 million to 1.4 billion - they dipped for two consecutive years: By 308 million transactions in 2015 and 449 million transactions in 2016 (up to October). But, only 154 million Indians have broadband, speeds slower than Bangladesh, China. For a majority of banking applications, a smartphone is a prerequisite. No more than 17 per cent of Indian adults own a smartphone, according to a 2016 survey by Pew Research, a consultancy. Of 930 million mobile-phone subscribers, only 154 million (16.5 per cent) have broadband connections, according to a March 2016 TRAI report, limiting access to mobile-banking. Another hurdle is the average time to load a page on a mobile phone: It takes 5.5 seconds in India, compared to 2.6 seconds in China, 4.5 in Sri Lanka, 4.9 in Bangladesh, according to a 2016 report by Akamai Technologies, a global content delivery network services provider.